2015 Oct 14. Announcing the winners. 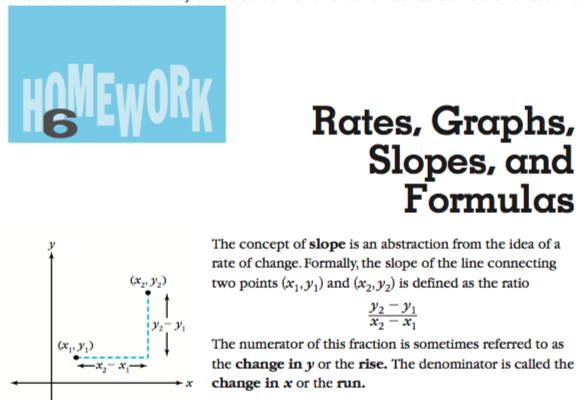 You should buy Anna Weltman’s new math book, This is not a Math Book. You should buy several, probably, for all the little people in your life who are deciding right now what they think about math and what math thinks about them. If they’re taking their cues on that decision from someone who dislikes math or who dislikes little people, consider using This is not a Math Book for counterweight. You’ll find dozens of pages of math art, math sketches, math reasoning, and math whimsy. I read it in one sitting outside a coffee shop one afternoon, big dumb smile on my face the whole time. Actually finishing the book, fully participating in Weltman’s assignments of creativity and invention, will take many more afternoons. Scan and send it to ddmeyer+loop@gmail.com. I’ll pick my five favorites and ask some of my favorite math artist friends to pick the winner from those five. 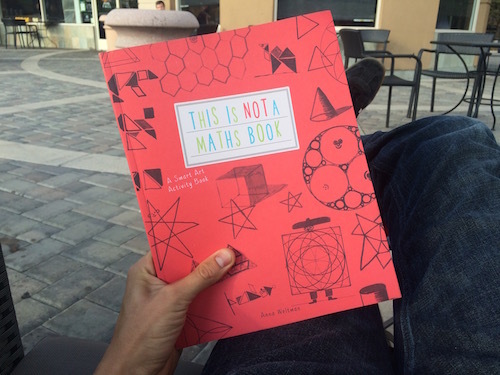 Winner takes all, which is to say 40 copies of This is not a Math Book, from me to you. Contest ends 10/6 at 11:59 PM Pacific Time. Drawings, color, character work, mixed media, it’s all fair game. I can’t wait. BTW. Over the next several days, Weltman is blogging interesting questions to ask your students about Loop-de-Loops. @ddmeyer can this be outsourced to a class and we send in our favorites? I spent a year working on Dandy Candies with around 1,000 educators. In my workshops, once I stop learning through a particular problem, either learning about mathematics or mathematics education, I move on to a new problem. In my year with Dandy Candies, there was one question that none of us solved, even in a crowd that included mathematics professors and Presidential teaching awardees. So now I’ll put that question to you. At the start of the task, I ask teachers to eyeball the following four packages. I ask them to decide which package uses the least packaging. After those questions have their moment, I tell the teachers there are 24 unit cubes inside each package. 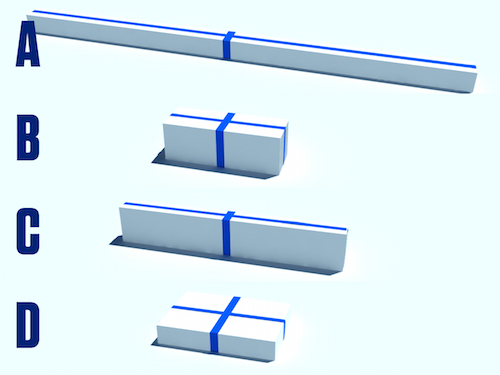 Eventually, teachers calculate that package B has the least surface area, with dimensions 6 x 2 x 2. We then extend the problem. Is there an even better way to package 24 unit cubes in a rectangular solid than the four I have selected? It turns out there is: 4 x 3 x 2. 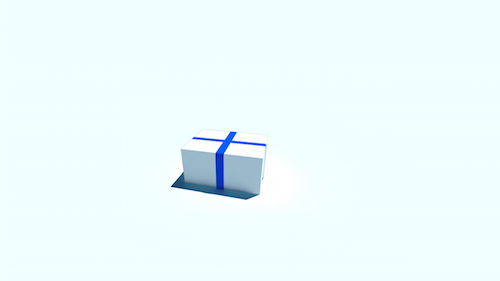 When pressed to justify why this package is best and none better will be found, many math teachers claim that this package is the “closest to a cube” we can form given integer factors of 24. We then generalize the problem further to any number of candies. I tell them that as the CEO of Dandy Candies (DANdy Candies … get it?!) I want to take any number of candies – 15, 19, 100, 120, 1,000,000, whatever – and use an easy, efficient algorithm to determine the package that uses the least materials. Write down all the sets of dimensions that multiply to that number. Calculate the packaging for that set of dimensions. Write down the set that uses the least packaging. Have a computer do the previous work. I need a rule of thumb. A series of steps that are intuitive and quick and that reveal the best package. And we never found one. Here was an early suggestion. Write down all of its prime factors from least to greatest. If there are three or fewer prime factors, your dimensions are pretty easy to figure out. If there are four or more factors, replace the two smallest factors with their product. Repeat step four until you have just three factors. This returned 4 x 3 x 2 for 24 unit candies, which is correct. It returned 4 x 5 x 5 for 100 unit candies, which is also correct. For 1,000 unit candies, though, 10 x 10 x 10 is clearly the most cube-like, but this algorithm returned 5 x 8 x 25. One might think this was pretty dispiriting for workshop attendees. In point of fact it connected all of these attendees to each other across time and location and it connected them to the mathematical practice of “constructing viable arguments” (as the CCSS calls it) and “hypothesis wrecking” (as David Cox calls it). These teachers would test their algorithms using known information (like 24, 100, and 1,000 above) and once they felt confident, they’d submit their algorithm to the group for critique. The group would critique the algorithm, as would I, and invariably, one algorithm would resist all of our criticism. That group would name their algorithm (eg. “The Snowball Method” above, soon replaced by “The Rainbow Method”) and I’d take down the email address of one of the group’s members. Then I’d ask the attendees in every other workshop to critique that algorithm. Once someone successfully critiqued the algorithm – and every single algorithm has been successfully critiqued – we emailed the author and alerted her. Subject line: RIP Your Algorithm. So now I invite the readers of this blog to do what I and all the teachers I met last year couldn’t do. Write an algorithm and show us how it would work on 24 or another number. Then check out other people’s algorithms and try to wreck them. Big ups to Addison for proposing an algorithm and then, several comments later, wrecking it. We’re all witnessing incredible invention in this thread. To help you test the algorithm you’re about to propose, let me summarize the different counterexamples to different rules found so far. Explicit instruction (teaching by telling?) is appropriate, even necessary, when the knowledge is based in a social convention. Then I feel that I need to “cover” the curriculum. We celebrate Thanksgiving on a Thursday, and that knowledge isn’t something a person would have access to through reasoning without external input―from another person or a media source. There’s no logic in the knowledge. But when we want students to develop understanding of mathematical relationships, then I feel I need to “uncover” the curriculum. You expect student to “uncover” calculus? Do constructivist teachers quietly just directly instruct such topics? Do they teach them, but pretend the students found them out for themselves? I can’t even begin to imagine how I could teach the derivative through constructivist techniques. So I hope Marilyn and anybody else with similar ideas about direct instruction will take up Chester’s question with force. It’s an important one, and mandates like “uncover the curriculum” seem more descriptive of philosophy than practice. It’s worth pointing out in closing that this direct instruction in IMP is preceded in each case by activities through which students develop informal and intuitive understandings of the formal ideas. This is in the neighborhood of pedagogy endorsed by How People Learn, which, again, you should all read. It just isn’t the example of direct instruction-less calculus Lawler seems to think it is. BTW. Clarifying, because I’m frequently misinterpreted: I don’t think learning calculus without direct instruction is logistically possible over anything close to a school year, or that it’s philosophically desirable even if it were possible. BTW. Elizabeth Statmore offers an excellent summary of the pedagogical recommendations in How People Learn. BTW. Chester references “constructivist teachers.” Anybody who sniffs back at him that “constructivism is actually a theory of learning, not teaching” gets week-old sushi in their mailbox from me. I think his meaning is clear. I consider CPM pretty strongly constructivist, and I am currently LOVING that calculus program. 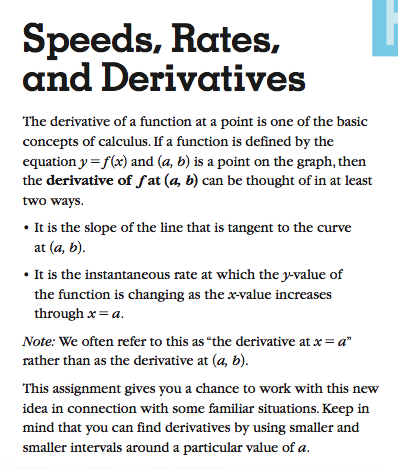 My kids are generating much better insights and dialogues around calculus than I have seen with other programs and what I am seeing suggests much better expected results on the AP exam. Don’t know if it is sufficiently pure to pass the “no instruction evar!” test that you seem to be using. “You expect students to understand calculus when taught using only DI? No matter what anyone says, “uncovering curriculum” is just discovery learning & concept formation in a different cloak. I started teaching back in the 1970’s when this method was in full bloom. Once we’d set the stage for ‘aha moments’ of understanding to occur, we let the struggle ensue. We were limited to asking a learner nudging questions, redirecting his/her efforts in a more fruitful direction when the chosen path was a dead end, and simplifying the problem so he/she’d trip over the gem. As one after another student ‘got it’, we imagined we could hear a series of little light bulbs popping on over their heads until the light of understanding in the room was blinding! The problem was that it’s impossible to be at every student’s side to ask just the right question at just the right moment all at the same time in a class of 25 or 30. First discoverers would end up telling their more baffled peers the secrets (hidden direct instruction). Some of the really lost got direct instruction from older siblings or parents. The awful thing was that students who didn’t get it couldn’t turn to the teacher for help, because they’d only get more questions & more ‘lead up’ to the place where the leap of understanding had to be made. Direct questions were not to be met with direct answers. The teacher didn’t believe in telling. And that’s the sort of dishonest thing about this method. The teacher has all the secrets. Everyone knows this is the case. The students’s job becomes finding and digging up treasure. For a some this is an act of learning. For many it’s like being in an elaborate guessing game with the prize of enlightenment denied those who are not capable players. The teacher had all the secrets but never tells. But what many teachers don’t get is that taking students through a process of discovering Uncovering those secrets is not the same as constructing personal understanding. And they also don’t factor into the learning experience the fact that direct instruction is everywhere. If you won’t share the secrets & homework has to be done, kids will ‘uncover’ up what they need online. Kids can circumvent your process with the tap of a finger if it will get them what they (or their parents) believe they need. Although deepening understanding is the goal, getting a toehold on being able to do some stuff can be a great place to start. How many of us who drive have a deep understanding of the physics, chemistry, and engineering that makes up our vehicles? Yet we can use them skillfully to solve problems. The same goes for cooking. If you can follow a recipe you can feed your family — which is a pretty fantastic result achieved without understanding how & why the recipe works. There’s nothing wrong with passing on knowledge and then getting on with helping kids learn how to apply it confidently and in a broad range of circumstances. As teachers, it’s our job to pack our tool boxes with as broad a range of strategies as possible so we can help each kid forge the connection of skill development & growth of understanding. I urge colleagues not to become so enamored with one approach that they become ‘one trick ponies’. I fear it will not serve you or your kids well in the long run. In an influential book for the National Academies Press in the US [How People Learn], the constructivist position is explained in terms of the children’s book Fish is Fish. In the story, a frog visits the land, and then returns to the water to explain to his fish friend what the land is like. You can see the thought bubbles emanating from the fish as the frog talks. When the frog describes birds, the fish imagines fish with wings, and so on. The implication is that we cannot understand anything that we have not seen for ourselves; each individual has to discover the world anew. Fish Is Fish is relevant not only for young children, but for learners of all ages. For example, college students often have developed beliefs about physical and biological phenomena that fit their experiences but do not fit scientific accounts of these phenomena. These preconceptions must be addressed in order for them to change their beliefs (e.g., Confrey, 1990; Mestre, 1994; Minstrell, 1989; Redish, 1996). To illustrate this phenomenon we need only look at Ashman’s essay itself. Ashman came to his essay with the common misconception that constructivists believe that “each individual has to discover the world anew.” Even though the How People Learn authors interpret Fish is Fish explicitly, that explicit interpretation wasn’t enough to dismantle Ashman’s misconception. A common misconception regarding “constructivist” theories of knowing (that existing knowledge is used to build new knowledge) is that teachers should never tell students anything directly but, instead, should always allow them to construct knowledge for themselves. A book is nothing if not a medium for explicit instruction and Ashman illustrates the limits of that medium here. Explicit instruction is powerful, certainly, and I can’t think of any influential scholars, least of all the authors of How People Learn, who would deny it. But it often isn’t powerful enough on its own to remedy a student’s existing misconceptions. Luckily, How People Learn offers many more powerful prescriptions for teaching and it’s free. BTW. Always relevant: The Two Lies of Teaching According to Tom Sallee. I’m bringing this feature back on the encouragement of Tracy Zager and because I ought to have more to show for the truly inappropriate sums of time I spend trawling the mathtwitterblogosphere. Bridget Dunbar has been blogging and tweeting for years but left her first comment on my blog last week, pointing me to her exceptional post comparing the pros and cons of three representations of the same problem. Ryan Muller is a software developer who writes about education research at his Learnstream blog. He seems curiously unaffected by education research’s typical turf wars, just happy to read and write about what he reads. Refreshing. Timothy McEvoy writes thoughtfully and critically about math edtech, a genre of writing that is in short supply. Tom Bennison runs the #mathsjournalclub chat on Twitter – a discussion group for math education research, which is the kind of social unit I’m already missing from grad school. Julie Reulbach offers us all a daily photo and caption from her innovative algebra classes. Yes, please. Kris Boulton applies our headache metaphor to a question about slope. Watch how his subtle alterations to the same task make its mental controversy more acute. More like this, please. John A. Pelesko and Michelle Cirillo are a university-level mathematician and math education researcher, respectively, and have paired up for a blog dedicated exclusively to mathematical modeling! Their post “Is this mathematical modeling?” gets it. Nathan Kontny writes breezy narratives about entrepreneurship, at least one of which (on audience) is still rattling around my head one month later.